This classic late 80's movie has finally arrived on Blu-Ray that paved the way for a new style of horror, one that was aimed at the teenage market. 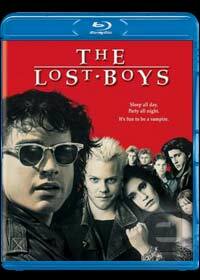 Unlike traditional horror movies, The Lost Boys featured a variety of pop culture references and flawlessly combined comedy with horror that also starred some of Hollywood's up and coming talents. The story revolves around two teenagers called Michael (Jason Patric) and Sam Emerson (Corey Haim) who have recently moved to Santa Clara Clafornia with their divorced mother to live with their dusty old grandfather, delightfully played by Barnard Huges. Unbeknown to Michael and Sam, Santa Clara is overrun by vampires, hence the high amount of missing children adverts. When Michael falls for one of the vampires who is played by the charming Jami Gertz, he is soon drawn into the MTV world of "modern" vampires which is led by David (Kiefer Sutherland). As Michael is bitten, it is up to his brother Sam and his comic book friend to liberate the town of Santa Clara in this entertaining action movie that is a little dated but is still quite enjoyable. The story is directed by Joel Schumacher who really creates a new pop culture of vampires (ala Buffy the Vampire Slayer and Twilight) which is craftfully filmed by cinematography Michael Chapman who gives the movie a truly surreal atmosphere to the whole production. The video quality of The Lost Boys is quite impressive which supports 1080p and looks exceptionally sharp and vibrant for a film that is over 20 years old. Although don't expect any reference quality Blu-rays but it's nice to see that Warner have putt some real effort into the transfer process. The audio quality also matches the improved Blu-ray video quality that nicely rounds out this movie. Although at times, The Lost Boys does seem a little dated, it's still a great look at a changing genre that is definitely still a cult hit that still manages to scare even after all these years. Comedy, romance and a healthy dose horror makes this this movie quite memorable which is complimented well with the improved video and decent sound track. Definitely one for lovers of the teenage horror genre.